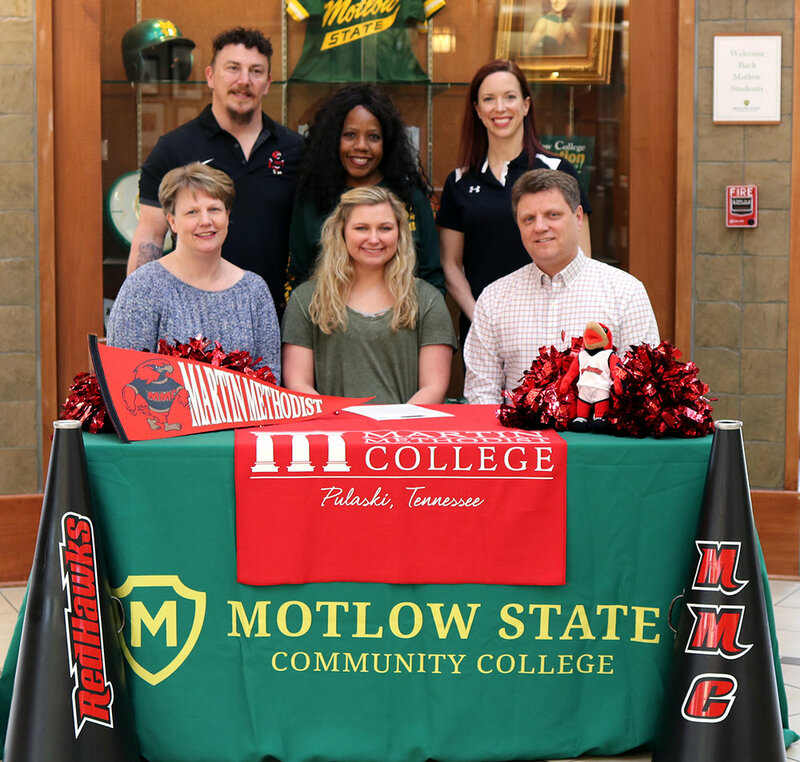 The Motlow State Community College Cheer Squad recently had two cheerleaders awarded full transfer scholarships to Martin Methodist College in Pulaski, Tenn. Emily Jordan Ray from Tullahoma, and Trevor Ivey-Bodman from Manchester, are the first Motlow cheerleaders to receive a cheerleading transfer scholarship since the program was reinstated two years ago. Joining Emily for the signing ceremony are, seated from left, Michelle Ray, mother; Emily Jordan Ray; and Cameron Ray, father. Standing from left, Micah Hartsfield, Martin Methodist head cheer coach; Bertha Smith, Motlow cheer coach/sponsor; and Monica Hartsfield, Martin Methodist head cheer/dance coach. Seated with Trevor are his father, Patrick Bodman, and his mother Denisa Ivey.